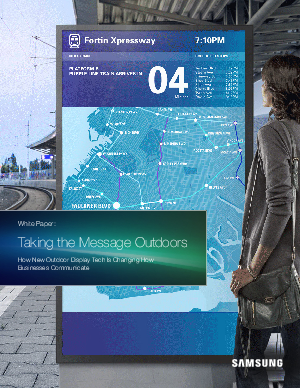 The many barriers that limited how digital screens could be used outdoors and in direct sunlight have all come down, making it possible now to get high impact, dynamic messaging in front of consumers in almost any situation. Rain, snow, heat and cold long conspired to make putting screens out in the elements – in a drive-thru lane or on a transit shelter wall – a costly, complicated and temperamental proposition. But no more. The possibilities are endless, but what’s clear now is that consumers both welcome and expect screens as part of their interactions. The early days were rough, but the technology and expertise is now there to fully deliver on those expectations.